Wisconsin residents know summer is a precious time of year! Seasons can swing from cold and rainy to humid and muggy, then back to cold and rainy again in the blink of an eye. 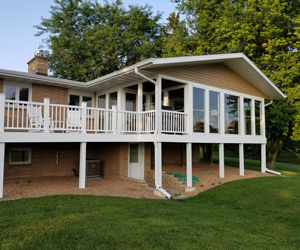 If you’re lucky enough to have a screened porch, summer is when you make the most of it! 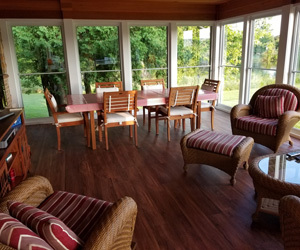 If you’re considering converting your porch into a multi-season room, there are a few key areas that need attention. Insulation is one of the most important factors when building or converting a multi-season room. It’s important to pay close attention to ceiling and floor insulation. Ceiling insulation in a multi-season room is just as important as attic insulation in a home. Ceiling insulation creates a thermal barrier to help keep comfortable air inside the room. Does the ceiling currently have access so insulation can be added? If the ceiling is not currently insulated and there is no access, the ceiling may need to come down for insulation to be installed. 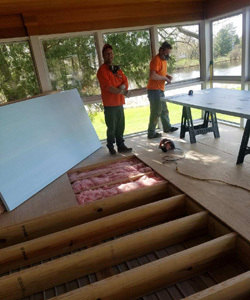 When insulating the floor of a multi-season room, air sealing is particularly important. Since multi-season rooms are not typically in contact with the ground, outside air can become trapped below the room and seep in through penetration points. If there is access from below it’s ideal to apply up to two inches of spray foam to seal air leaks. After spray foam is applied, the cavity can be filled with a blown-in insulation system or fiberglass batts can be installed. The final step is to enclose the area by installing a solid surface such as rigid foam or plywood. If you plan to tear up the floor, consider installing spray foam to seal air leaks followed by filling the remainder of the cavity with a blown-in insulation system or fiberglass batts. The final step is to install the new floor system. When planning your multi-season room, be sure to talk with your contractor about windows and a heat source. Installing high quality windows and sealing air leaks around the windows will help maintain a comfortable inside temperature. Since Wisconsin winters can be very cold, consider adding a heat source so you can enjoy the space all year long.